There are a lot of things I miss about New England, but at the top of the list is definitely the fall season. Changing leaves, cool crisp weather, pumpkin patches, hayrides and apple picking. Nowhere has fall quite like New England. As a kid, I remember going apple picking every fall. We’d pick bushels and bushels of apples, then we’d head to the pumpkin patch to pick out the best one. After that, we’d head inside where we could watch the apples being processed, rolling through a huge machine that removed leaves and stems and buffed them to a glistening sheen. We could also watch fresh cider being pressed, and–my favorite– fresh apple cider donuts being plopped into the fryer. Another thing I love about fall? It’s officially the start of hot coffee season. On a cool fall morning there’s nothing better than a steaming cup of hot coffee. And when it comes to hot coffee, I’m definitely a sucker for delicious flavored varieties. So it’s no surprise that when I had the opportunity to try two flavors of Folgers Gourmet Selections®, I was in love. Folgers Gourmet Selections® Vanilla Biscotti Coffee is flavored with hints of freshly baked vanilla biscotti. 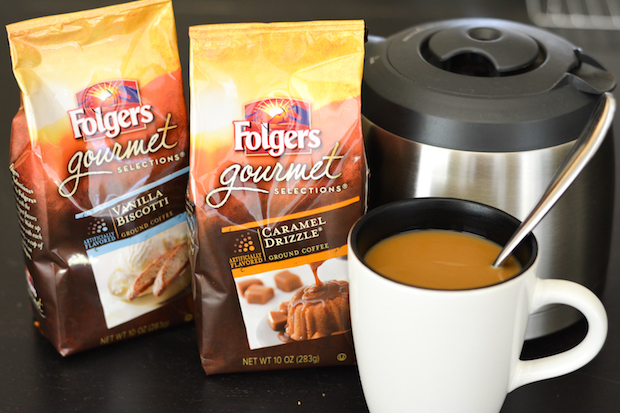 And though I loved both flavors, my favorite was the Folgers Gourmet Selections® Caramel Drizzle® with its soft, buttery caramel flavor. The Caramel Drizzle® really put me in the fall mood and had me thinking about caramel apples and holiday pies. There are two things I never get sick of smelling. Fresh coffee brewing and fresh donuts frying. 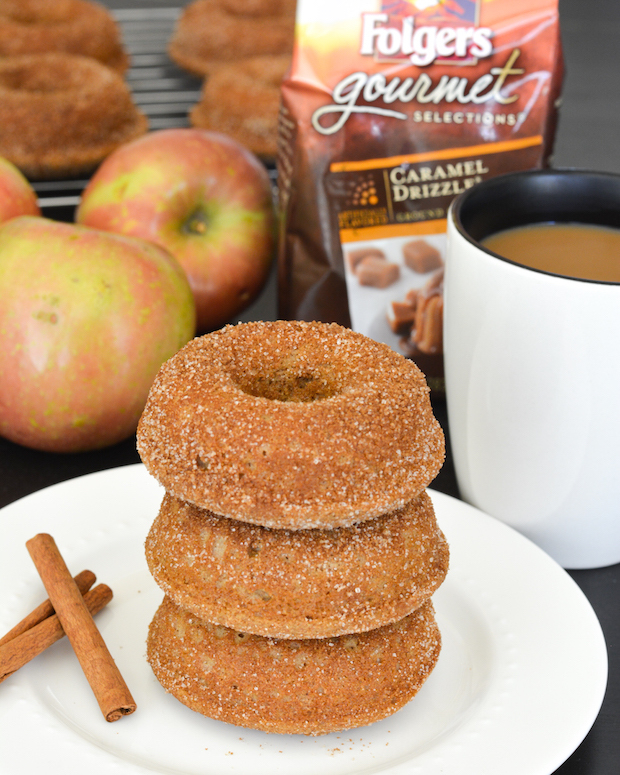 Since the Caramel Drizzle® coffee got me in the mood for fall, I decided I wanted some apple cider donuts! I mean, what goes better with coffee than donuts? Since I can’t be trusted with an entire batch of fried heaven, I decided to bake my donuts instead. And then I even decided to add a little whole wheat to cut the sugar rush just a tiny bit. But there is still SO much fall in these donuts. Reducing down the apple cider in these donuts really concentrates the flavor and gives them a great appley taste. And I promise they’ll make your house smell just as good as the apple orchards! Heat the apple cider in a small pot over high heat with cinnamon stick and whole cloves. Bring to a boil, then reduce heat and simmer 20 minutes uncovered, stirring occasionally. Set aside to cool. Preheat oven to 350 degrees. Spray a 12-donut donut pan with with nonstick spray and set aside. In a large bowl, combine flours, baking powder, soda, 1½ tsp cinnamon, cloves, allspice and salt. In another bowl, whisk egg together with ½ cup sugar and ½ cup brown sugar. Whisk in melted butter, then milk and vanilla. Remove the cinnamon stick and whole cloves from reduced cider. Stir ½ cup of reduced cider into the wet ingredients. Reserve remaining cider. Pour wet ingredients in dry and gently mix until just combined. Transfer batter into a pastry bag or large ziplock with the corner snipped off. Pipe the batter into prepared donut pan, filling each well about ¾ full. Bake 20 minutes, until a toothpick inserted into a donut comes out clean. Cool 5 minutes in the pan. While the donuts are cooling, mix 1 tbsp cinnamon with ¼ cup sugar and ¼ cup brown sugar in bowl. Remove donuts from pan. One by one, use pastry brush to brush each donut with a bit of the reserved cider, then coat in cinnamon-sugar. Serve immediately or store in an airtight container in the fridge. Microwave 20 seconds to reheat and serve warm. These donuts paired perfectly with a steaming hot cup of Caramel Drizzle® coffee, doctored up with a little cream and sugar! They’re the perfect seasonal breakfast, afternoon snack or even dessert. What are your favorite things about fall? Are you into flavored coffees? What’s your fave? I so wish I had one of these donuts now, Jess! I bet they would will fall to finally come and stay. We had one or two awesome fall days recently, but the temperature went right back up after so it felt like summer again. I love that these are partially whole wheat, and I agree – perfect for pairing with a cup of coffee! Ugh… it’s supposed to be 100 degrees here tomorrow. The weather just can’t make up it’s mind and I’m SO OVER summer! Bring on fall! What if you don’t have a donut pan? Since I don’t usually make donuts I don’t own one of these pans……and I hate to buy one for something I don’t use a lot. It would be great if there was a place you could just rent kitchen bakeware. Barbara– You could easily use a mini muffin pan or even a regular muffin pan… they’d just be more like donut holes. Just keep an eye on them in the oven– the might need to go a few minutes longer if you’re using a regular muffin pan. By the way– I got my donut pans for about $7 each at Marshall’s… definitely a good investment, even if I only use them a couple times a year! I’ve never been to New England before, but it’s on my list of places to visit. I really want to go in the fall so that I can experience the colors! These donuts sound amazing, Jess! I just made apple cider donuts a few weeks ago that I’m sharing tomorrow, but I’ve definitely got to try your version. I love that you used whole wheat flour and coated in cinnamon and sugar! Sounds so perfect to go alongside my morning cup of coffee! Those doughnuts sound heavenly. They must have smelled just amazing. 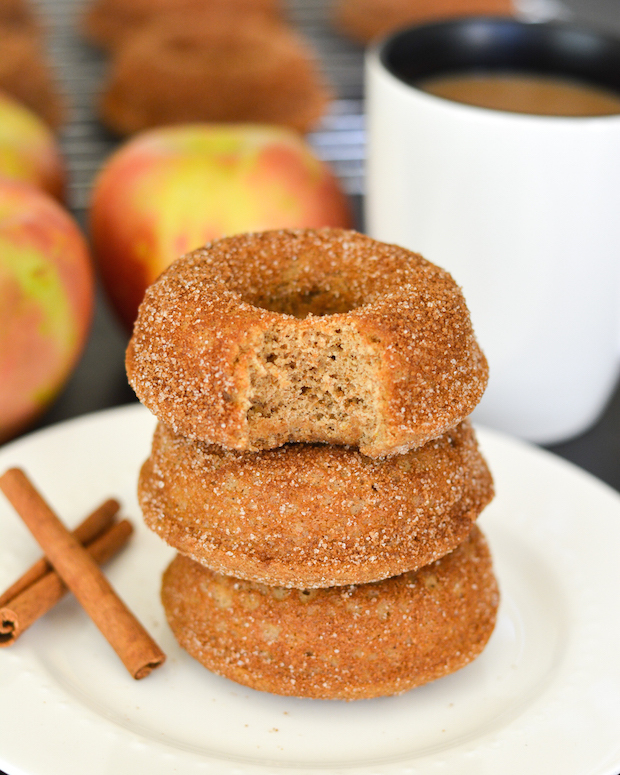 Love apple and cinnamon things in the fall! 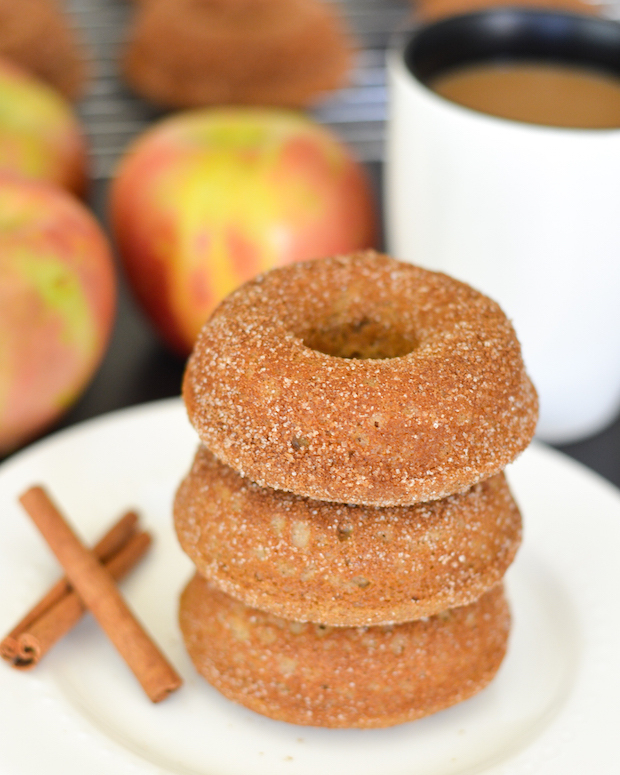 I love apple cider donuts in the fall! Yours look perfect. Can’t wait to make these! I’ve always wanted to visit New England in the fall! One day, one day. 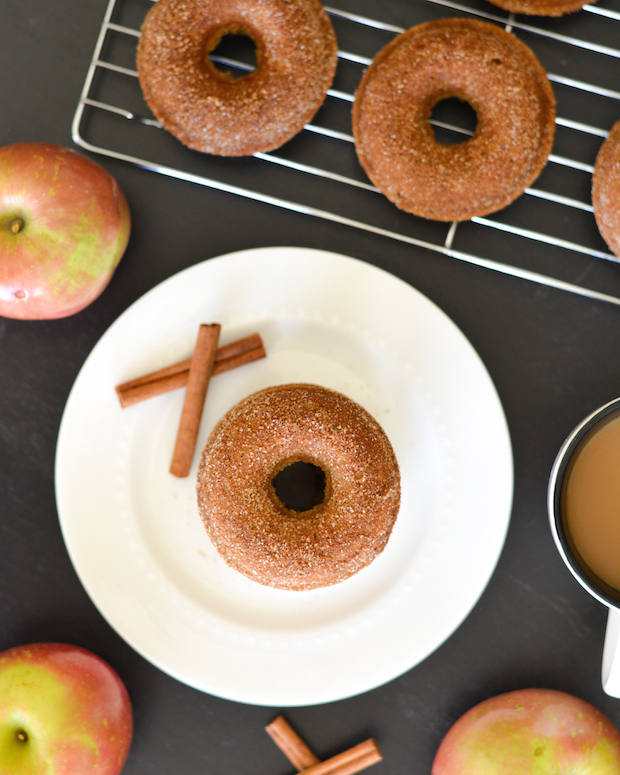 And there’s nothing better than coffee with a donut, especially a healthier baked version with apple cider! Thanks, Sarah! Fresh donuts baking is definitely the best!